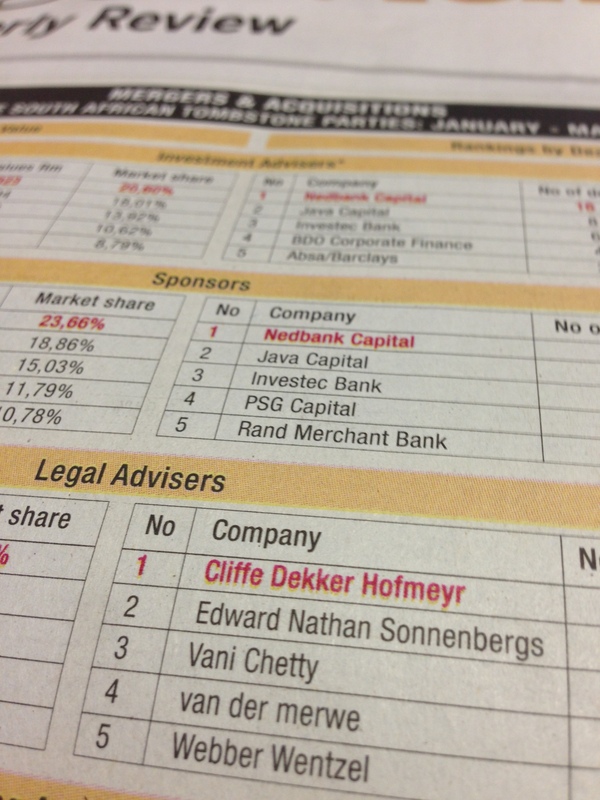 We would like to take this opportunity to express our appreciation for your valued support and to proudly announce that we have just been ranked 4th for “Mergers and Acquisitions by deal flow” in the whole of South Africa by “Dealmakers” in their latest publication of their legal advisors category. What makes this rating significant is that there are only 6 admitted attorneys currently attending to matters dealt with by Van Der Merwe Attorneys, a valid indication of the standard of skills that we posess. We value their support and we will continue to use our best endeavors to add value to their organizations and aspirations. Extract of Dealmakers in the Busdiness Day newspaper on 9 May 2013.